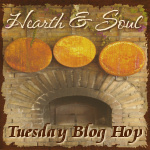 Welcome to the Hearth and Soul Hop, the blog hop for recipes using healthy ingredients, family and comfort food recipes, articles about healthy living, real/slow/local/sustainable food, foraging, herbal remedies, organics and gardening. I want to take this opportunity to wish everyone a Thanksgiving filled with love, abundance, family, friends and happiness. I’m looking forward to seeing what you all share this week! By linking to the hop you are giving permission to feature your properly credited posts and photographs here on The 21st Century Housewife as well as on Facebook, Twitter, Google + and Pinterest. We share every post on Pinterest, either on the hosts’ own boards and/or on our shared board Recipes from Hearth and Soul Hop Contributors. Would you like a reminder when The Hearth and Soul Hop is live? Please take a moment to subscribe to my weekly newsletter in the box below the linky / above the comments. Thank you so much for including my Cranberry Relish Sweet and Spicy in your Thanksgiving Ideas, I really appreciate it. Wishing you and your family a bountiful Thanksgiving and thanks so much for hosting the party! Wonderful assortment of Thanksgiving ideas. Have a wonderful holiday. Thanks for hosting the party. Hope you have a Happy Thanksgiving. Happy Thanksgiving to you too, Annamaria! My pleasure, Barb. Thank you for sharing it. And I think everyone freaks out a bit before big holiday celebrations 🙂 Happy Thanksgiving! Thanks for featuring my Thanksgiving Stuffing! It’s a pleasure, Jill. Happy Thanksgiving! Thanks for hosting April and happy thanksgiving. Thank you for hosting, April. Seeing all of these TG dishes has me anticipating Thursday. I can just smell it! Wishing you and yours a very Happy Thanksgiving, Michelle! We absolutely love your bog andd ind most of your post’s too be just what I’m looking for. can you offer guestt writer to write contenbt available for you? I wouldn’t mind writing a post or elaborating on majy of the subjects yoou write concerning here.